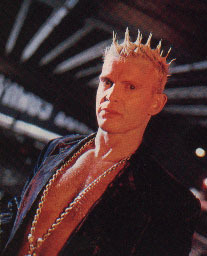 With a rebel yell and a sneering upper lip that could hold more pencils than Mick Jagger’s, Billy Idol strutted on stage in 1983 to make pots of money turning punk into pop. But how does a 37-year-old 80s relic remake his image for Nintendo-era kids—Generation X fans who have no idea that Generation X was the name of Idol’s old band? By getting into the computer game. Idol hopes to score his first big hit in three years with Cyberpunk, a new album inspired by William Gibson’s novel Neuromancer—the 1984 compu-fi saga that popularized the term cyberspace, the ultimate virtual reality. "I threw off the shackles of the past," says Idol. "I was looking for a way to break the stalemate I’d gotten into, which was boring me to death, really." Computers provided a nice way to start again: Idol recorded Cyberpunk on a home system controlled by a Macintosh that made short work of manipulating vocals and drum tracks—he even used it to create the album’s cover art. "It can do anything," gloats Idol. "If you want the music backwards, it can do backwards in a snap. This is in a way my sort of answer to grunge. I know there’s a way of using this modern technology to bring a lot of the rawness back. The Mac doesn’t just make a glorified demo—it’s a virtual studio!" His new video "Shock to the System" was made with cyberstar special-effects maven Stan Winston (Terminator 2, Jurassic Park). And idol launched Cyberpunk with the rock world’s first mass-marketed interactive floppy disk press kit, designed by software engineer Jaime Levy. Plans for the Cyberpunk tour, starting in late October, are ambitiously mind-boggling. "The main lighting for the arena," says idol, "will be massive screens hooked up to swarm-cams roaming the audience and fed into the blendo cube run by an Amiga computer"—which distorts and reassembles video imagery in synch with Billy’s tunes. "It’ll be freaked out." "Somebody was going to do the cyberpunk thing eventually," says Levy, 27, "so I prefer is to be Billy than some completely geeky person. If it was up to me, it would be Gary Numan or Meat Beat Manifesto or some industrial band. But they couldn’t blow it up as big as Billy and get the funding. So if it’s gonna be somebody who’s a major star, I guess I’d pick Billy Idol. He sorta looks like a cyberpunk, and he’s actually from the punk era. I mean, you want somebody who’s at least from the 80s!"